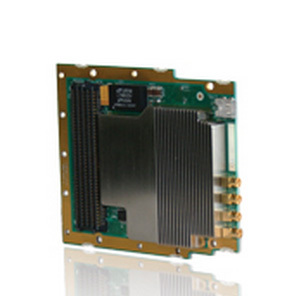 The Radio420X FPGA mezzanine card (FMC) is a powerful multimode SDR RF transceiver module designed around the state-of-the-art, multistandard, multiband Lime Microsystems LMS6002D RF transceiver IC, which supports broadband coverage, as well as TDD and FDD full duplex modes of operation. The LMS6002D RF transceiver IC's bandwidth (1.5-28 MHz), selectable on-the-fly, makes it suitable for a large number of narrowband and broadband applications, while maintaining good channel selectivity. Combining this to multiple references and synchronization modes, the Radio420X is right at home in such applications as multimode software-defined radio (SDR), advanced telecommunications (MIMO systems, cognitive radios, LTE, WiMAX, white space, Wi-Fi, GSM, WCDMA), and signal intelligence (SIGINT). The Radio420X is the first in the Radio42X family, an SDR version that allows applications in the spectrum under 3 GHz. However, a new memebr of this family is already under development, the Radio421X, which will specifically target LTE applications. Keep visiting for developments. FMC HPC — two RF transceivers. Refer to literature for mechanical limitations.